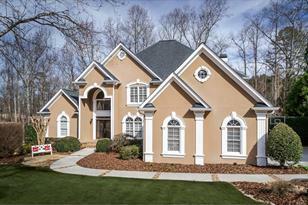 Pristine home nestled on cul-de-sac along 18th fairway of gated Crooked Creek Golf/Swim/Tennis Club. Space abounds in this open & light filled flr pln enhanced w/soaring ceilings, exquisite trim/finishes, new fixtures, freshly painted in/out & 2 screened porches. Formal Liv & Dining rms, 2-stry fam rm w/LG pic windows, updated gourmet kit, lux master on main, spacious secondary beds including teen ste w/media rm & all baths updated. Finished Terr LVL - open/spacious for media, game & entert space, bed/bath w/steam shower, & storage. 3-car gar. Hardcoat Stucco. Driving Directions: GA400 to exit 11. Turn left on Windward Parkway, right on Deerfield Pkwy, Right on Hwy 9 north. Left into Crooked Creek. Turn right on Chipping Wood Court, Right on Eighteenth Fairway. 14535 Eighteenth Fairway, Milton, GA 30004 (MLS# 6512358) is a Single Family property with 6 bedrooms, 4 full bathrooms and 1 partial bathroom. 14535 Eighteenth Fairway is currently listed for $650,000 and was received on February 28, 2019. Want to learn more about 14535 Eighteenth Fairway? Do you have questions about finding other Single Family real estate for sale in Milton? You can browse all Milton real estate or contact a Coldwell Banker agent to request more information.